Thanksgiving is surprisingly right around the corner, meaning it’s the prime time to start thinking about what meals you’ll be cooking up this year. While most individuals like to stick to the more traditional food items of turkey and chicken, we like to incorporate delicious seafood into our Thanksgiving dinner! If you’re a seafood lover like we are, we encourage you to branch out and do the same. Here are 3 easy seafood dishes you should serve this Thanksgiving. Thanksgiving is always hectic. So, while you’re frantically preparing other dishes, here’s an easy one that can simply cook in a crockpot. 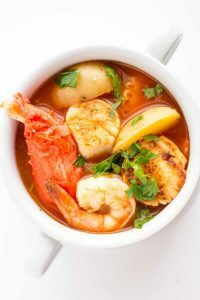 This savory stew combines all of your favorite, fresh types of seafood into one wonderful dish. 2 pounds of seafood of your choice (some options include shrimp, crab, white fish, scallops, clams) We suggest using 3 of these choices! Excluding only the seafood, add all of the other ingredients into your slow cooker. Cover and let cook on high for 2-3 hours or on low for 4-6 hours. When the potatoes are cooked through, this is when you should move on to the next step. Add the seafood into the slow cooker and set to high heat. Be sure the seafood is completely thawed, if previously frozen, before adding to crockpot. 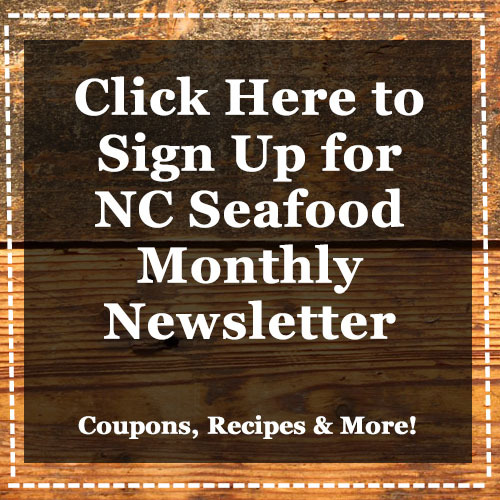 Let cook for 30-60 minutes or until seafood is fully cooked. Place it on your Thanksgiving table and serve with warm bread! We know this combination sounds a little unique, but trust us, it’s amazing. Everyone loves fresh shrimp and pumpkin; mix them together for a scrumptious appetizer. Peel and devein the shrimp, while leaving tails on. Thoroughly rinse and cook the shrimp in a large amount of boiling water for 2 to 3 minutes. Then, drain the water. In a medium bowl, thoroughly mix together the canned pumpkin, goat cheese, lemon juice, and honey. In another bowl, mix the shrimp, arugula, onion, and salad dressing together. Arrange pieces of baguette slices on a baking sheet and brush both sides with olive oil. Broil in oven for about 2 minutes or until toasted. Flip bread over after 1 minute. 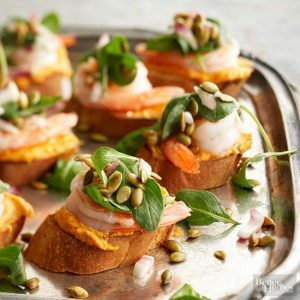 Spread pumpkin mixture over each baguette slice and top with a shrimp and the arugula mixture. You can also add parmesan cheese to the top if desired. Arrange them on a nice, festive plate and watch them disappear! There’s nothing like some fresh crab for the holidays! Here’s a side dish that everyone will enjoy. In a medium bowl, mix softened cream cheese and sour cream together until smooth. Slowly mix in crab, cheese, and onions, afterward. Cut the top third layer off of each loaf of bread and hollow out the bottom to mimic a bowl. Cut the removed bread into bite-sized pieces and add to the crab mixture. 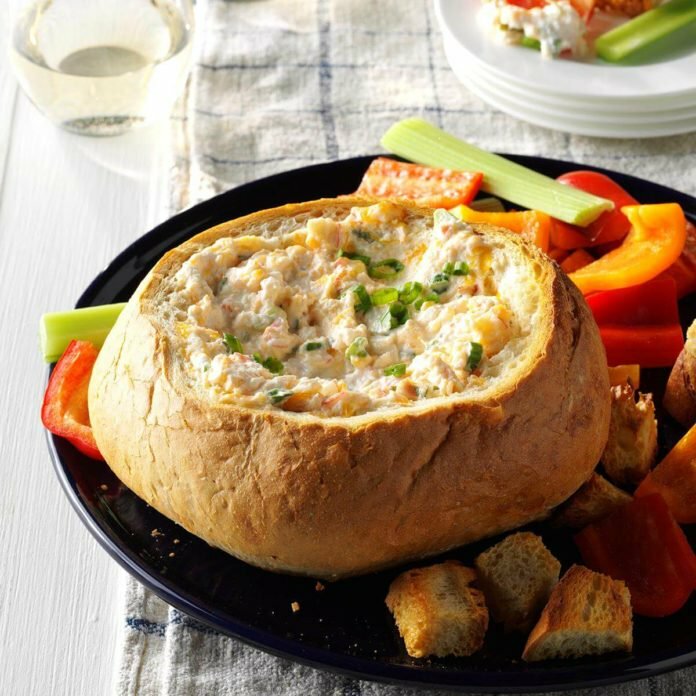 Spoon the crab mixture into the bread bowls. Place bread bowls on a baking sheet and bake, uncovered, at 350 degrees for 45-50 minutes. Take it out the oven and serve with either vegetables or crackers of your choice! You can also garnish it with green onions if desired. Aside from these savory dishes, you can never go wrong with some fresh baked or fried fish served atop a bed of veggies, or a classic shrimp pasta! Whatever seafood you may choose to have at your Thanksgiving table, we’re sure it’ll be delightful! We hope you have a wonderful Thanksgiving and enjoy your time with family and friends! After the Thanksgiving holiday, be sure to come enjoy our delicious, fresh seafood prepared right from our kitchen to your table.